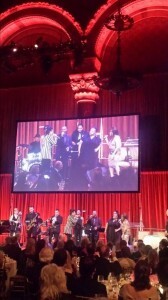 About a month ago, we had the opportunity to play for Literacy Partners’ Annual Gala Fundraiser at Cipriani’s in Midtown Manhattan – one of the nicest locations in NYC. If you’re not familiar with the organization, check them out at www.literacypartners.org. As a band that primarily performs at weddings, doing cool events like these, supporting great organizations like Literacy Partners is a pretty special opportunity for us! The main highlight for us was getting to be the backup band for some superstar artists. We got to perform with Mama Funk, Nona Hendryx (Originally sang “Lady Marmalade” with The Labelles), Valerie Simpson (Wrote “Ain’t No Mountain High Enough”, “Ain’t Nothing Like The Real Thing”, and tons of other Motown / Soul hits), and even Bette Midler for a very short time. It was quite an awesome night! For the event, we provided a jazz trio featuring trumpet / guitar / bass during the cocktail hour, and then we provided solo classical piano during dinner. We also provided walk-on and walk-off music for all of the featured guests as they made their way to the stage for speeches. That music was provided by our trio of sax / guitar / bass. Finally, we provided a full band of 3 singers, 3 horns, keys, guitar, bass, and drums to back up the guest artists. We then played a one hour dance set that completely rocked the party at the end of the night. Thanks very much to Literacy Partners for having us be a part of such an awesome event!